Did you know that Liberty Homes of PA does home remodeling, too? We're more than a vacation home builder in the Poconos, we also remodel existing homes, second homes and vacation homes or cottages. Which Home Renovations Provide the Best Return on the Investment? Homeowners and prospective buyers look at a home very differently so it's useful to consider a remodeling project from a buyer's perspective when you're thinking of selling your home. But which projects are most effective for the housing market? 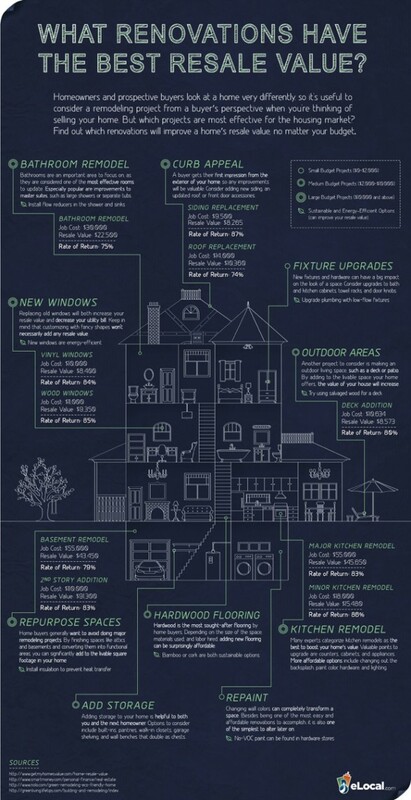 Find out which renovations will improve a home's resale value, no matter your budget with this helpful infographic from eLocal.com. Do you have a great home in a great location but need an update to a dated room or outdated design? Do you need more space in your current home - maybe an extra bedroom or home office? Have you decided this is the year to finally finish that basement and turn it into a home theater or children's play area?